Thanks a lot for this unusal and beautifull works!! !Do you have Pascal Dusapin "Medea Material"? Alas Horacio, sorry to disappoint. 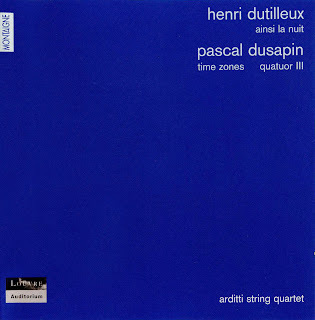 I only recently discovered Dutilleux, let alone Dusapin. I was fortunate enough to see the Ardittis perform these pieces many years ago. What a revelation! There is no better string quartet for contemporary works. Thank you very much! Merci voor deze niet-evidente CD! 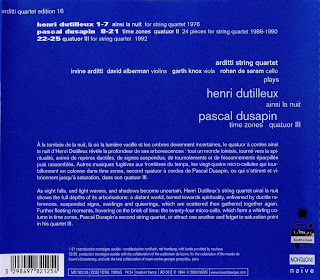 I discovered Dutilleux late in life but through a documentary which I have never been able to get a copy of. And the Arditti are a guarantee as to how the work is performed. BIG fan of both. Dank je voor deze kamermuziek. Erg interessant. Waar kan ik vinden hoe ik zelf ook een blog maak. Ik heb al zoveel muziek binnengehaald, dat het logisch is om ook wat terug te doen?